Heat oven to 350°F. Place 8-oz ramekin (right side up), in center of 9-inch round cake pan. Separate dough into 8 biscuits. 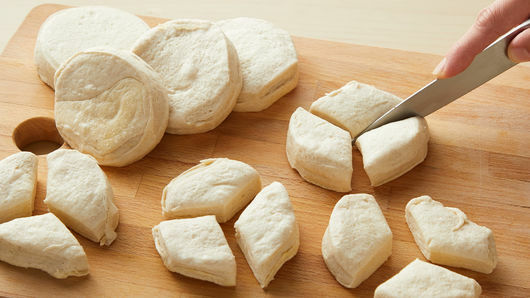 Cut each biscuit into 3 wedges, for a total of 24 wedges. Reshape and press each wedge into a 3-inch circle. 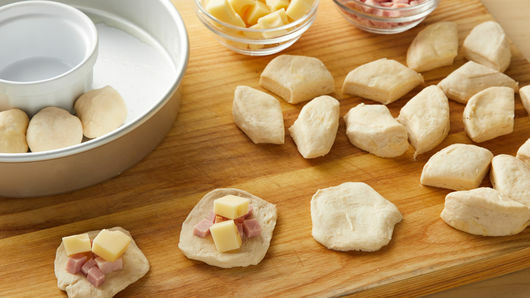 Place a rounded teaspoon of chopped ham and 2 cheese pieces in center of dough. Carefully wrap dough around ham and cheese, and firmly pinch to completely seal around it; shape into ball. Place balls around edge of pan (surrounding the ramekin), alternating and stacking some on top of others. In small bowl, mix melted butter and onion powder. 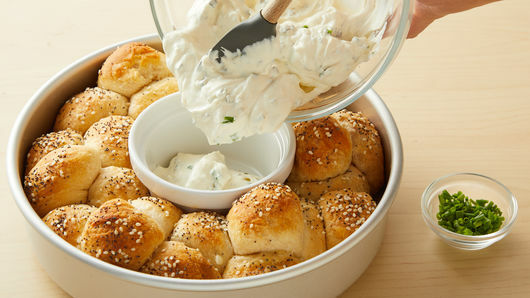 Brush tops of dough with melted butter mixture; sprinkle with poppy seed and sesame seed. Bake 35 to 40 minutes or until biscuits are fully baked and deep golden brown. Cool 10 minutes. In small microwavable bowl, microwave cream cheese uncovered on High 30 seconds; stir. Continue microwaving in 15-second increments, stirring after each, until cheese is stirred smooth. Stir in sour cream and 2 teaspoons of the chives. Transfer mixture to ramekin dish in pan; top with remaining 1 teaspoon chives. Serve with warm biscuits. Feel free to use only sesame seed or poppy seed, instead of a mixture of both, if you prefer. If you don’t like either of these seeds, you can make the biscuits plain, too. Packaged diced ham is sold in the meat section of the grocery store. It saves time over a whole piece of ham—you don’t have to dice it yourself—but either works in this recipe. 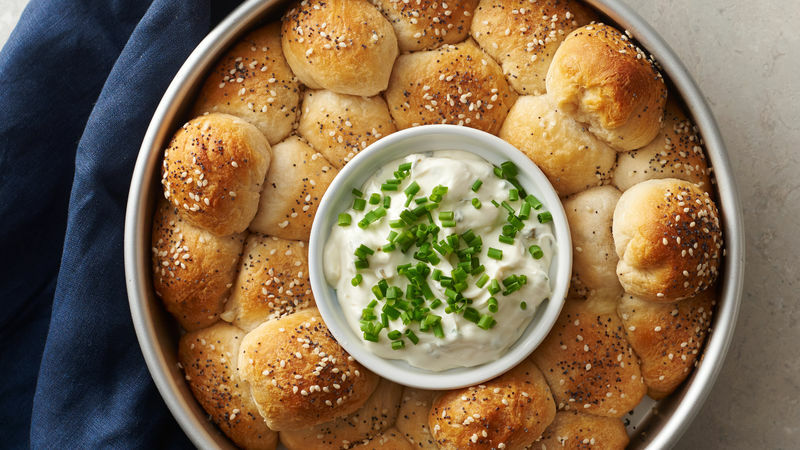 A cake pan is the perfect vessel for serving this appetizer, keeping the sandwich dippers (and dip!) nice and warm until you’re ready to serve. 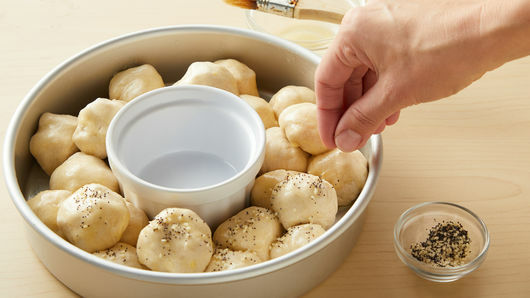 When stacking the stuffed dough balls in the cake pan, be sure to avoid placing too close to the outer edge of pan, to help reduce any cheese bubbling over the edges. Be sure to use the right size ramekin in this recipe. To accurately measure your ramekin dish, measure 8 oz of water, and pour into dish. If water reaches the top outer rim, you have the right size.